The family has been cultivating wines in Gumpoldskirchen since 1746. In 1998 the wine cellar was relocated and a modern, functional winery was built surrounded by vineyards. Today, 35 hectares are cultivates in the best locations of Gumpoldskirchen. We put great emphasis on natural grape cultivation, as well as on strict grape selection. The wines from our treasure chamber help to achieve the best quality each year. The Romans have already recognized the various advantages of wine growing of the thermal spring region. Even today, this wine growing area is known as the Burgundy of Austria due to its favorable climate conditions and the same level of latitude as Burgundy. The weather conditions and the loamy soils dominated by limestone are perfectly suited for red, white but also sweet wines. Above all the autochthonous grape varieties Rotgipfler and Zierfandler love the climatic conditions. These main advantages make it possible to age wonderful wines with a long storage potential, but also vinify wines with great drinking pleasure when they are still young. With Gustav Krug’s pioneering spirit, the harmony of tradition and innovation is in a balanced relationship. He is always keeping an eye on wine making knowledge and tradition, whereas he also trying out something new, like producing vegan wine. Above all are the standards of quality which each wine has to meet. Gustav Krug is always saying “when you put something good in, you can just get something good out”. Concluding it can be said that only the best is good enough for winery Krug. >> Die Vollendung 2015: 93 Pkte. >> Privat rot – Cabernet Sauvignon 2012: 92 Pkte. >> Merlot Reserve 2013: 91 Pkte. >> Chardonnay Reserve 2014: 91 Pkte. >> Kreuzweingarten 2015: 91 Pkte. >> Rasslerin – Rotgipfler 2015: 90 Pkte. >> Die Vollendung 2015: 92 Falstaff-Pkte. >> Privat weiss – Rotgipfler 2013: 92 Falstaff-Pkte. >> Kreuzweingarten 2015: 91 Falstaff-Pkte. >> Privat rot – Cabernet Sauvignon 2012: 93 Falstaff-Pkte. >> Merlot Reserve 2013: 91 Falstaff-Pkte. 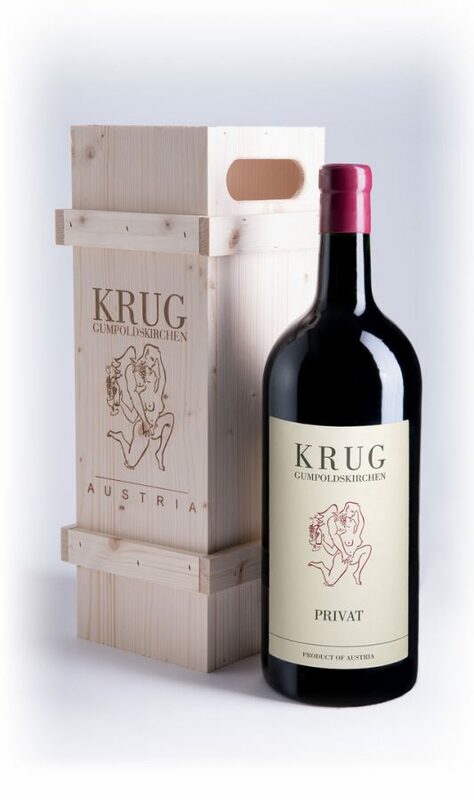 The picture of a pair of lovers has become KRUG’s emblem in recent years. It shows Psyche and Cupid. The god of love was commissioned by his mother Venus, who was jealous of the beautiful mortal Psyche, to pair Psyche off with the ugliest man. However, Cupid grew weak at the sight of her and made her his own lover. To escape detection, their amorous play could only take place in the dark. But Psyche was bursting with curiosity. In the glow of an oil lamp she recognised her lover, and the affair became known. After some turmoil came the happy ending: Jupiter let Psyche drink ambrosia, the drink of the gods, which makes one immortal, and in this way elevated her to divinity. » Browse and order in the online shop now! » Stop by and sample!